When you think about sustainable transportation, what image comes to mind? Perhaps it’s a bus, a bike, or an electric car. These vehicles can certainly lower the negative impacts of the miles we travel. But what about something that could shrink the distances we drive, lowering the number of miles we need to go every day? Instead of a vehicle,imagine a building—a longish, two to four-story structure like those you’ve seen in every Vermont downtown and many villages. Let’s call it an urban block building. It sits close to the street and opens to the sidewalk. People work or shop on the first floor, and work or live upstairs. The urban block first appeared here in the mid-19th century and became ubiquitous by the late 1890s when Vermont architecture embraced a more urbane, 20th-century future. Because it evolved before the automobile age, the urban block building was designed to enable walking and transit. It provided a large amount of floor space on a small parcel of land, concentrating activity within a tight, walkable radius in the center of town. It offered a highly-prized amenity—easy access to every business and service. Railroads offered speed for longer trips, but within Vermont’s small communities, travel was slow. Proximity was essential and density made perfect sense. Higher, bigger, flat-roof structures made it possible for more people to locate in a place they could walk to where they needed to be. When considering transportation, it’s natural to think of a vehicle, but the structures we build, where we locate them and how we arrange them, have a profound impact on the way we move and how far we travel. If buildings are low and spread out, relatively empty and isolated on large exurban lots—like most of what was built in Vermont between 1950 and 2008—we are left with only one travel option. We drive, mostly alone, and farther than most other Americans go every day. We’ve made some progress reducing the environmental impacts of travel by moving toward more environmentally benign fuel sources, but far more effective would be to employ those vehicles in a landscape where the places we need to go every day are much closer together, allowing us to walk and and ride a bus or bike. Vermont once had a built environment that worked perfectly well for walking and transit. A dense arrangement of multi-story, multi-use buildings huddled on village streets, ringed with neighborhoods and connected by sidewalks is just the kind of land use pattern that can make transportation efficient and sensible again. This is why the urban block building is making something of a comeback. 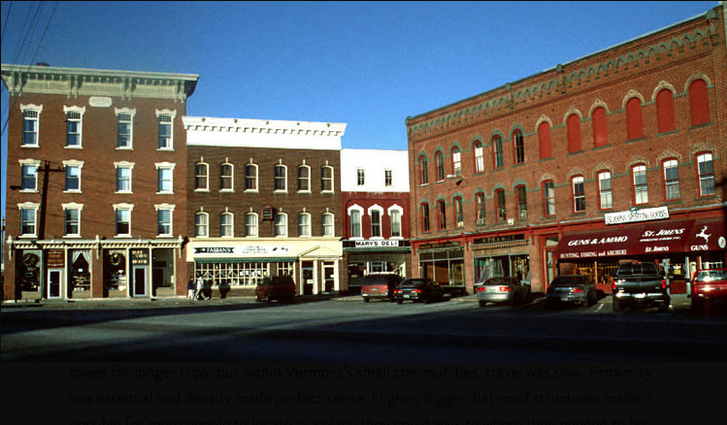 In past decades, Hardwick, Randolph, and St. Johnsbury rebuilt key downtown blocks that had been destroyed by fires. Renovations of historic blocks—like those in Morrisville, Brattleboro, Essex Jct., and St. Albans—have been key part of community revitalization efforts, bringing residents and businesses back downtown. Today, there’s a mini-boom going on in White River Junction, where two four-story buildings are rising on separate downtown lots, a few blocks away from other recently completed mixed-use projects. Senior housing one block away from Main St. The urban block building is an architectural type, but it’s also a land-use tool—a way to concentrate a critical mass of people in a small walkable, transit-friendly radius. We know from our own experience, the timeless appeal of these buildings, and how they constitute the fabric of Vermont downtowns. We know how beautiful and useful they can be. We need to think of them (as well as other components of the built environment you’ll hear about in future posts) as a key strategy for creating more sustainable transportation.